When viruses are introduced into a new population, selection pressures can lead to evolution of both pathogen and host. The pathogen must adapt to a new host, while the latter can become resistant to infection, leading to an arms race. 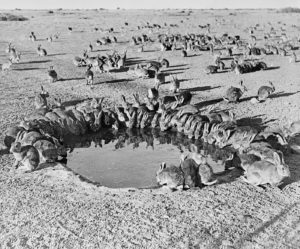 An archetypal example of such host-pathogen evolution is illustrated by the attempt to control rabbit populations in Australia by the release of a pathogenic virus. Recent work illuminates the changes that occurred as the rabbits became resistant to infection. European rabbits were introduced into Australia for sport in 1859, and lacking natural predators, the animals reproduced to huge numbers (image credit). After other control measures failed, myxoma virus was released in the 1950s in an attempt to rid the continent of the animals. The virus is spread by mosquito vectors, and European rabbits are killed rapidly – infection is 90 to 99% fatal. In the first year, the virus was efficient in killing rabbits, with a 99.8% mortality rate. However, by the second year, the mortality dropped dramatically to 25%. In subsequent years, the rate of killing was lower than the reproductive rate of the rabbits, and hopes for 100% eradication were dashed. Epidemiological analysis of this artificial epidemic provided important information about the evolution of viruses and their hosts. As expected, the infection spread rapidly during spring and summer, when mosquitoes are abundant, but slowly in winter. Given the large numbers of rabbits and virus particles, and the almost 100% lethal nature of the infection, attenuating mutations were selected quickly; within 3 years, less-virulent viruses appeared, and some infected rabbits were able to survive over the winter. The host-virus interaction observed was that predicted for an evolving host, coming to an equilibrium with the pathogen. A balance is struck: some infected rabbits die, but many survive. For 69 years this story of rabbits and viruses has fascinated researchers. Recently a study was undertaken to understand how the rabbits changed after myxoma virus infection. The coding region from the genome of modern rabbits from Australia as well as France and the UK (where myxoma virus had also been released) were determined and compared with animals from museums that had been stored before the virus release. The first examination of the data revealed that more rabbit alleles changed in frequencies across the three countries than would be expected by chance. The vast majority of these SNPs (single nucleotide polymorphisms) were already present in museum samples. This observation explains why rabbit resistance to myxoma virus arose so rapidly: the mutations were already in the population 800 years ago! Initially 193 SNPs were identified in 98 genes and 7 intergenic regions that changed in their frequency from museum to modern rabbits. Of these, 20 SNPs were specific to the population of one of the three countries, and 20 were selected in parallel. The population specific changes were likely a consequence of differences in ecology, the genetic background of the rabbit, or simply independent paths of evolution with the virus. Some of the rabbit alleles with an increased frequency are within one of the interferon (IFN) genes, which encodes a protein of the first line of defense against viruses. The proteins carrying these changes were more effective at inhibiting the replication of an attenuated strain of myxoma virus. It is possible that virulent myxoma virus selected for increased potency of this particular IFN. Another SNP occurred in the rabbit gene encoding VPS4, which is not antiviral but is required for viral replication. The change might in some way alter VPS4 so that it is less able to support viral replication. SNPs were also found in the gene encoding a protein needed for proteasome function. The proteasome is needed for myxomavirus replication and it is possible that changes in the gene have suppressed this function. It is informative that only 1% of the selected alleles have become fixed in the modern rabbit populations. The implication is that resistance to myxomavirus infection involves multiple genes which vary in frequency across the genome. Consequently virus reproduction is reduced, but not eliminated. This situation would favor the emergence of more virulent viruses, which was observed after the initial decline in viral virulence. As might be expected, these viruses have become highly immunosuppressive – to counter the effects of changes in the host immune system described in this study.